We’re a group of specialists who help people reach their lifestyle and fitness targets through a range of activities, techniques and therapies. All our people are fully qualified, highly experienced and brimming with infectious enthusiasm. Train on the beach at Croyde Bay, friendly village halls in the area, at our personal training gym in Ilfracombe or even at your home. We also do retreats and camps further afield in incredible places like France and Fiji. Everyone’s different. So wherever possible we look to tailor programmes to fit you. That’s why we always like to start with a consultation and go from there. But if you know what you want, why not get going and sign up for a session? Bay Fitness would not be so popular if were not for the charisma and unique approach Andrew Blake shares with everybody who chooses to give a Bootcamp, retreat or personal training session a go. Andrew has a holistic approach to fitness and wellness using all his experience from fitness, coaching, yoga, sports therapy, and running retreats worldwide. He has a wealth of experience dealing with athletes and clients of all levels including Olympic athletes, International sports teams, professional football and rugby teams and the worlds best surfers. 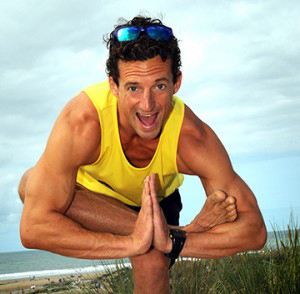 He has internationally recognised qualifications in fitness, coaching, lecturing, massage therapy and is a 200 hour vinyasa flow yoga teacher. Founder of Bay Fitness, Andrew Blake, has been lecturing, coaching and training athletes of all levels for over 10 years in Devon, France, New Zealand and Fiji. He is a qualified L3 personal trainer and nutritionist. He has two degrees and is a qualified football, tennis and surf coach - fluent in French and learning Spanish. - Rebecca is a qualified osteopath, masseuse and physical therapist. - Enjoys seeing a wide range of clients from mums-to-be to professional sports people.